I’ve been thinking a lot lately about the work Joe Rantz did that summer. In fact, I have been pondering many aspects of Joe’s life for nearly six years now. 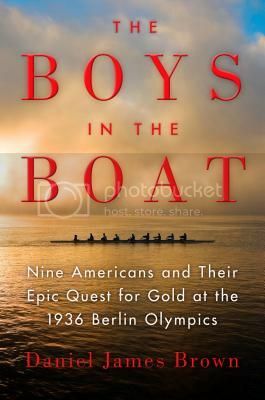 It has taken me that long to research and write the story of how he and eight other extraordinary young men from the Pacific Northwest came together to form arguably the greatest collegiate rowing crew of all time. To understand their story, I’ve had to get to know all nine of boys pretty well, mostly through their letters, their diaries, and interviews with their children. In the process, I’ve had to live mentally in 1930s America—Joe’s America—for a long while now, only occasionally coming up for air and taking a peek around at America in the early twenty-first century. But now, with my book about their epic accomplishments—The Boys in the Boat—finished, I’ve finally remerged fully into the year 2013. And boy oh boy does it look familiar. Sometimes it feels as if I’ve never left Joe’s America. Like my own America, Joe’s America was ravaged by a climate that seemed suddenly and unaccountably out of whack. A steady litany of weather aberrations characterized the 1930s: unprecedented heat waves set hundreds of local records that still stand today; drought stretched throughout most of the decade; the calamitous black blizzards of the Dust Bowl carried away most of the topsoil in the American heartland; massive forest fires raged in tinder-dry timber country; the Labor Day Hurricane of 1935, stronger than Katrina and one of only three Atlantic hurricanes ever to make landfall in the U.S. as a category five storm, devastated Florida. Joe’s America, of course, saw the worst economic hard times in our history. At the height of the Great Depression nearly half the mortgages in the country were delinquent. Millions were left homeless and adrift, standing in breadlines that stretched for blocks from the doors of soup kitchens. Sprawling “Hoovervilles” sprouted up all across the nation. Hundreds of banks and other major financial institutions long thought to strong to fail, failed. The lifetime savings of millions of ordinary Americans were utterly wiped out, never to be regained in the long slow recovery to come. And Joe’s America was torn asunder by rancorous political wrangling that stunted any attempt to bring relief to the long-suffering American people. Workers striking for reasonable work hours and decent wages were met with billy clubs, tear gas, and even machine guns In the White House a determined president proposed to harness the powers of government to redeem the nation, only to be met by unusually harsh rhetoric and obstruction. “An undemocratic departure from all that is distinctively American” screeched Henry Fletcher, Chairman of the Republican National Committee. “[This] creeping paralysis of bureaucracy threatens freedom of the press, placing the yoke of torture, colossal expense, and demoralization on the nation” opined Idaho’s Senator Frank Borah. Sound familiar? No one would argue that today’s America is as bad off as Joe’s. The Great Recession was not the Great Depression. But it was bad enough. We don’t have Hoovervilles. But wander into the center of any American city today and you will find plenty of homeless folk living in the backseats of cars or under bridges. We no longer have breadlines. But millions work for wages so low that they can barely put food on the table at the end of the week. We have not approached the near twenty-five percent jobless rate of the early 1930s. But a weak labor market has dashed the dreams of a generation of young Americans. We have not seen the cataclysm of the 1929 stock market panic. But trillions of dollars of retirement savings will never be regained in time for older Americans to retire on schedule, and millions more Americans will never regain the homes that banks have repossessed. We have not had another Dust Bowl, but we have seen a rising crescendo of climate-related disasters. We haven’t had labor riots. But we’ve seen public workers’ rights systematically stripped away state after state. And God knows our politics couldn’t be any more toxic than they are now. Another energetic president has striven for four years now to harness the power of government to undo what he inherited, only to be met with an opposition so obdurate that it cannot rise above name-calling, filibustering, and obstruction. One thing, though, that characterized Joe’s America is strikingly absent in ours, and it is why the image of Joe lowering himself over a cliff at Grand Coulee comes so frequently to my mind these days. The Grand Coulee Dam was just one of hundreds of large-scale public works projects that by the end of the 1930s left America a much better place than it had been in 1929. Among the many monuments that we take for granted today are the Oakland-Bay Bridge, Hoover Dam, the Triborough (RFK) Bridge, the River Walk in San Antonio, and National (Regan) Airport in Washington D.C. But even more important to Joe’s fellow Americans were the thousands of smaller scale projects that made everyday life easier, safer, more sanitary, and more comfortable—124,000 viaducts and bridges built or improved, 572,000 miles of roadway, 39,000 schools, 2,500 hospitals, 12,800 playgrounds, countless sewage treatment plants and water mains. Trees were planted, precious topsoil conserved, floods controlled, forest fires prevented, campgrounds established, and hiking trails opened up. In all of this millions of jobs were created. Legions of young men and women like Joe, who had no other way to feed themselves or find housing or send themselves to school, saw their lives utterly redeemed by the work and the meager paychecks it provided. But the public works projects of the 1930s—both large-scale and small—spawned something even more important than jobs. They gave birth to a deeply felt national spirit of common effort—a sense that there was a way out of the terrible hard times, if only everyone began to pull together. Pulling together was something Joe Rantz and his crewmates on the University of Washington’s eight-oared rowing team understood. In rowing every individual must work in perfect harmony with his or her teammates. Each stroke of the oar must be flawlessly synchronized with the strokes of all the others. Each rower must pull just as hard and with precisely the same rhythm as the others. And most importantly, each must be committed to the common goal, ultimately caring as much whether the others in the boat succeed as about whether he or she succeeds individually. The early years of the Great Depression profoundly humbled young Americans like Joe. It taught them that great individual effort and self-reliance are not in fact always enough to get through tough times. Their suffering taught them humility, and humility allowed them to do what we seem incapable of doing in our America. In Joe’s America ordinary citizens, politicians, business leaders, legislators and presidents finally learned reach out to one another, put aside bickering, lean into their oars, and strive together for the common good. Today as our representatives in Washington DC continue to wrangle, many of the bridges and schools and roadways that Joe’s generation built are crumbling before our eyes. The great public monuments that they so proudly built are growing shabby and decrepit. And the question that hangs in the air is whether we have learned anything at all from Joe’s America. Great guest post! I read a nice review by Kim at Sophisticated Dorkiness of The Boys in the Boat earlier today. Everything I’m seeing so far about Boys in the Boat is pointing toward me loving it. Great to read this!